St Joseph’s vital Division One clash with fellow title hopefuls Worksop Borough had everything. The 2-1 win for St Joe’s may prove a pivotal result and although both sides have the credentials to win the league, St Joe’s are now in the driving seat. Borough had the better of the early exchanges with a number of long range efforts that didn’t trouble Jepson in the Joseph’s goal. Phil Richardson and Ben Brown looked dangerous for Joseph’s on the counter attack. It was Richardson who managed to win the corner midway through the first half that led to the opener. A good delivery brought a fine finish from Pickering to put Joseph’s in front. One or two meaty challenges and a couple of scuffles later saw Durrant’s strike deflected into the bottom corner, leaving Jepson in the St Joseph’s goal with no chance. 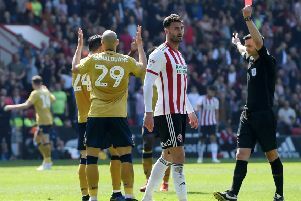 There was controversy early in the second half when Joseph’s player-manager Guest was sent off by referee Christian Pimperton for an incident with Durrant. With a numerical advantage Borough assumed control, forcing a number of chances, but poor finishing and a number of decent stops from Jepson kept the scores level. As the game moved towards the latter stages Brown managed to get free down the right and produced a cross for Richardson who finished with aplomb. More excitement followed when Borough stalwart Salty Pettinger had a frank exchange of views with the referee and was asked to leave the game. In the final minute Steve Scott was penalised for handball which brought division between the two sides and supporters. The final kick of the game was left to Borough’s Booth to convert the penalty but Jepson had other ideas and managed to get down well to his left and save. Both teams deserve credit, the game was played with pace, passion and aggression. Elsewhere, Greendale finally broke their penalty goodoo in a 4-2 win over Shireoaks Sports. Just three minutes in, a foul on Lee Edmondson gave the home side a penalty but after four consecutive misses there was little confidence. However, leading scorer Chris Rose accepted responsibility and netted. Edmondson made it two after a flowing move but individual errors allowed Shireoaks back into it, goals from Nathan Clayton and Sam White drawing them level. A rasping 30-yard strike from Alex Ibberson proved too hot to handle as Greendale made it 3-2 shortly after the interval and the victory was completed with a late Scott Connell goal. Worksop Magpies beat Corinthians 9-3 with six goals from Harper, while Inter Kilton got a first win of the season, beating Yates OB 4-2. Langold Lakeside were 5-1 winners at Whitwell FC, Woodsetts Welfare drew 1-1 with Lion Hotel and Langold OB put seven past Lokomotive Millhouse. The league can be found on Facebook at 7 Core HCL Worksop Sunday League.